It takes a village to create a new musical. And it takes a village like A Little New Music to give musical theatre writers a place to showcase new material while their Broadway-hopeful shows are in development. It’s an important part of the process, getting your songs in front of an audience. For the last four years, A Little New Music has presented quarterly concerts that offer the best new songs musical theatre has to offer and audiences can’t get enough of it. Neither can those behind the scenes. The producers of the series readily admit they love what they do and each one brings his or her own unique perspective to the process of “putting on a show.” Meet Peter Welkin, Christopher Maikish, Luke Klipp, Amy Francis Schott, and Kila Packett from A Little New Music. In this interview, they discuss their roles as producers and what musical theatre means to them. I hope you enjoy this window into their world. For many years I thought that the only way to be part of musical theater was to work really hard learning to sing, act and dance and then jump at any chance to take the first paid gig that came along. That taught me a lot about the trials and tribulations of being a performer but I was always chasing the tail of the business, trying to fit into the mold of the established musicals and the previously-defined characters that were required. When I got involved with the Academy for New Musical Theater, I had a revelation – a nearly spiritual one. I realized that there was a whole new world of possibilities when it came to being in on the ground floor of developing new musical theatre works. I wanted to be part of the bleeding edge of this new musical theatre world, and ever since then, I’ve been involved in innumerable shows, readings, presentations, and more recently, concert productions, showcasing exciting new musical theatre material. Early on, an ALNM concert attendee remarked that she “loved what we were doing and that she was so excited to feel like she was getting a sneak-peek at the future of Broadway.” Something fresh, something new, something exciting, that’s what keeps me motivated to do to this. Answering this need for our audience makes them more like an insider, and puts them closer to the cutting edge of the musical theatre art. I love to be able to say, “Oh yeah, Come From Away is on Broadway now, but we presented a song from that show almost two years ago, before most people had ever even heard of it.” That’s super exciting to me! Luckily, I’m not the only person who needs to maintain the vision for what we do. Our team is composed of people with really different backgrounds who are all dedicated to volunteering their time to bring our shows to fruition. We often rotate the producing roles when we build a show to avoid burnout. As an entirely volunteer group, each of us makes the choice to spend our free time working on this. That means we’re each dealing with our various jobs, relationships and family obligations, which can easily distract us. It’s not always easy to keep everyone moving in the same direction. But, knowing that we have a team of people who care deeply about the quality, freshness, and excitement factor in the new material makes my job that much easier. Because our production structure encourages rotation of roles for each concert, I think it breeds empathy amongst the team and also allows us an opportunity to engage intellectually with varying parts of “putting on the show.” Most of us have volunteered more than 500 hours each since 2012, encompassing 14 LA concerts, a special San Francisco engagement at Feinstein’s, and two years of presenting the “ALNM Outstanding Songwriting Award” at the Hollywood Fringe Festival. The hats I’ve worn in my own professional life have been as performer, graphic designer, marketing manager, hospitality, and museum administration. I guess I shouldn’t have been surprised that this project would end up being a great unifier of those experiences. And the time I’ve spent collaborating with writers, performers, and producers has given me the confidence to lead, and to lead with purpose. In the early days, we discussed having themed concepts for each show, but we decided that the idea of the “NEW” was more than enough. We really just want to share the songs we are most excited about. What generates that excitement? It might be a world premiere, an underserved storyline, a sophisticated melody, an unexpectedly clever lyric, an amazing new writer LA needs to meet, a show with momentum, the opportunity to break from tired casting tropes, a damn-funny song, or simply an unforgettable moment. Programming always feels a little bit like winemaking – you’re never fully in control of what the audience will experience, but you’re after the right balance of ingredients. We lean towards keeping the night upbeat, crisp, and fun. We program an eclectic blend of musical styles and we do seek a few name performers per concert. The hard fact is that it helps create momentum for filling the room, but we love local, new talent. We look for a balance in representation for both writers and performers regarding gender, race, age, life experience, etc. Logistics don’t always let us achieve that perfectly, but these are transparent and active conversations. That ethos has been front and center for me since the beginning. A Little New Music is in pursuit of a future artistic world and I believe diverse representation starts with the decision makers. Female, Trans, and POC writer friends – know that we want to hear from you. If our evening of songs is serving a singular idea, for me it’s this: You are not alone and you are welcome here. All of you. Let’s celebrate. At a time when society is receding into the numbing safety of technology, bringing the LA theater community into the same room to reflect on human life, to find an entertaining escape, or to make new connections feels more important than ever. I know performers who have found agents and lucrative projects from singing at our concerts. I know people who literally met and fell in love. And I know emerging writers now within earshot of producers we’ve had in our rooms. It’s intensely satisfying to have helped facilitate that. 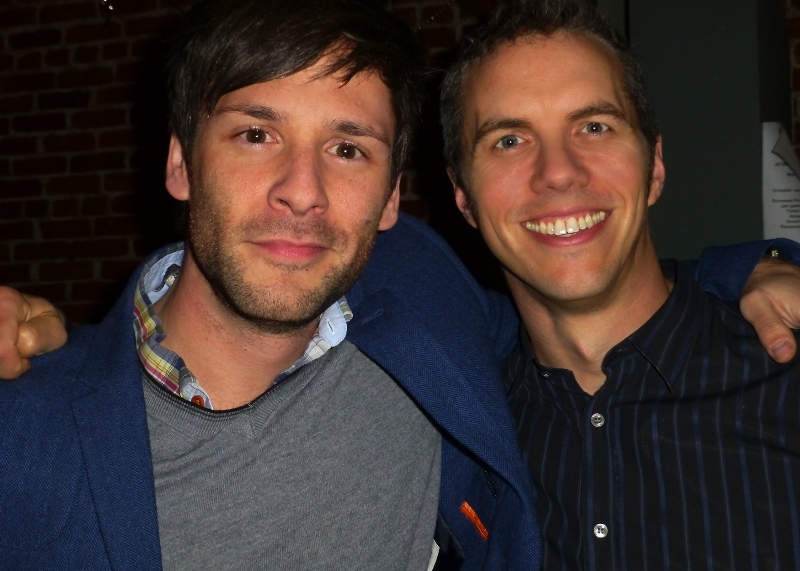 Chris Maikish and I originally conceived ALNM as a commercially-accessible artistic presentation and as a way to further connect LA’s burgeoning musical theatre community, but there’s been a growing sense in the last few months that this community offers even more than that. Musical theatre is one thread of a much larger artistic tapestry that gives people comfort, joy, hope, and conviction in difficult times. For me personally, performance and politics have generally been separate, and the challenge in straddling two very different worlds has made committing wholly to either of them virtually impossible. What I hope people are starting to recognize within the current political climate is that there is more to life than its mere existence, and that we also need to consider what makes life worthwhile. Musical theatre – and the arts more generally – are an invaluable element to that idea of what makes life worth living. Every single show that we have done has had moments that brought me to tears, moments that made me laugh out loud, and moments that caused me to think about my life and my role in the world. Every single show. For this particular show, I’m the utility player. Whatever needs to be done, I’ll do it. I’m a longtime stage manager so it’s natural for me to take on that role with ALNM. My other role, and the one I love the most, is writer outreach. Writers are the rockstars of my world: what they do, creating words and music which come together into more than the sum of their parts. That is the coolest thing I can imagine. We get a lot of song submissions – over 80 this last round – and there are songs we carry over because we love them and want to present them but, for whatever reason, they don’t fit into the current show we’re doing. Sometimes it’s because we can’t find the right casting or because another song we’ve chosen has too much similar DNA. We’ve held songs over 3 or 4 times, sometimes even a year, until it finds a place in the right show. Tim Rosser and Charlie Sohne are NYC writers and we’ve featured them a number of times in our concerts. When their show The Boy Who Danced on Air had its world premiere at Diversionary Theatre in San Diego last year, we were able to get the two leads to come up to LA the week after it closed to sing a duet from the show. Now the musical is about to make its Off-Broadway premiere at Abingdon Theatre Company in May. A few years ago I met the writers of Come From Away at NAMT (National Alliance for Musical Theatre), Irene Sankoff and David Hein. We ended up having lunch together and we became Facebook friends. The next year, Come From Away was featured at NAMT. It was one of the most extraordinary musicals I’d ever seen and everyone was talking about it. Through that connection, we were able to present “Me and the Sky” from the show in our September 2014 concert. Since then, I’ve had the joy of seeing it brought fully to life at La Jolla Playhouse in 2016 and now the world can see it on Broadway! We’ve programmed songs by established writers like Kate Kerrigan and Brian Lowdermilk (their new show The Mad Ones is about to go up Off-Broadway) and also up-and-comers like Michael R. Jackson. The first time we featured Kerrigan and Lowdermilk was an unusual situation. They have a friend who is an opera singer, Zach Altman, and I had seen him sing this amazing song “One Last Prayer” from their musical Republic, based on Shakespeare’s Henry VI, Parts 1 & 2 and set in Northern Ireland in the 1970s. It was stunning. 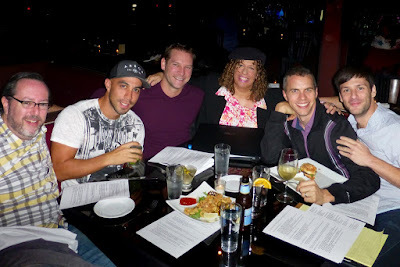 Turns out, Zach was going to be in LA and we were able to make arrangements for him to come and perform with us. The first time I heard Michael’s music was in a late night concert after NYMF (New York Musical Festival). He wrote a song called “Miss Lucy” that I fell in love with and I asked him about it after the show. Cut to later when he submitted “Bathtub At The Beverly Hills Hotel” for ALNM and we found the amazing Jasmin Richardson (who’s on tour with The Bodyguard right now) to perform it. The song is sung from Whitney Houston’s point of view in her final moments. Jasmin gave an incredible performance and it ended up becoming one of the high points of the series. There are a lot of ways we bring the people to our village. Our website, designing posters, emails, press releases, videos showcasing our writers and performers, social media posts on Facebook, Twitter, and Instagram; college outreach, musical theatre clubs, and word of mouth; returning patrons, and of course name talent! For example, on social media, I want our followers to join us in the day-to-day journey of how we piece a concert together. Similar to how celebrities post stories on their Facebook Live and Instagram, I like to be transparent with our audience by giving them a real behind-the-scenes view of our process. We have followers from all around the country who seek out musicals and, if we can make our routine a little more personal, it gives them a sense of being part of our community – a vibrant and constantly growing family of artists and art lovers. We are always trying new approaches for our promotional videos, and because music is such a great part of what we do, we want to challenge the listener to hear us in exciting new ways. I grew up loving musicals from watching movies and TV specials, records, and cassette tapes. I remember seeing Annie in the movie theater, The Mikado on PBS, my aunt played Guinevere in a production of Camelot, and my mother owned the recording of Funny Girl but I never saw a Broadway musical live until later in life. I know there are people just like me who want to hear the newest material so it makes promoting our work that much easier. There is a huge audience out there and social media not only brings our work to the masses, it helps us find new talent. That’s what I love about being at the forefront of cutting edge musical theatre. I get to be an ambassador for lovers of this art form and help bring people together. It doesn’t get better than that. A Little New Music’s producing team also includes Corey Lynn Howe, Mitch Glaser, Katherine Washington, Katie Porter, Chelsea Rae Bernier, Eran Scoggins, Michelle Lane, and musical director Gregory Nabours. Their next concert is April 24th at Catalina Bar & Grill, 6725 Sunset Blvd, Los Angeles, CA 90028. Doors open at 7pm for the 8:30 pm curtain. For tickets and more information, call (323) 466-2210 or visit www.alittlenewmusic.org. Since 2013, A Little New Music has featured over 170 songs by writers such as Sankoff & Hein, Pasek & Paul, Miller & Tysen, Ryan Scott Oliver, Carmel Dean, Kerrigan & Lowdermilk, Milburn & Vigoda, Adam Gwon, Joe Iconis, Drew Fornarola, Zoe Sarnak, Erik Przytulski, Michael Finke, Rollins & Levine, and Gregory Nabours. More than 200 performers have appeared in ALNM concerts including Daisy Eagan, Jeff Marx, John Tartaglia, Shoshana Bean, Barrett Foa, Nicole Parker, Krysta Rodriguez, and Michael A. Shepperd.